With a medium to slow initial growth rate increasing to around 15cm a year, Euphorbia ammak has a number of common names including the ‘Pale Euphorbia’. 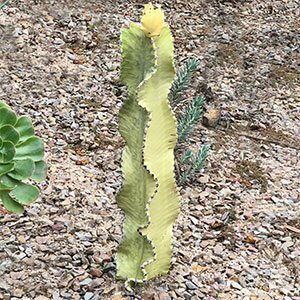 It is incorrectly described as the Candelabra Euphorbia . Over time Euphorbia ammak will reach 6 metres in height and will form an open tree like structure. The species itself has pale green stems and therefore a little usual as well as very attractive..
A variegated variety with creamy markings is also identified, however this is actually a different species Euphorbia candelabrum erythreae variegata. Rare in cultivation, this is a Euphorbia that deserves a little more attention by landscapers. The trunk and branches are thick, ridged and along the ridges sharp spines add to the appearance. Small flowers appear in summer followed by small fruits. Found growing in Yemen through to Saudi Arabia, this is a succulent plant plant that makes an excellent landscaping feature. Grow Euphorbia ammak in a container as an indoor plant, use it in the garden as a feature plant in a sunny protected position. A humus rich well drained soil is essential. Very good drainage in winter and frost free position are also important as these are natural conditions for the plant..
Best grown in full sun, a little extra water during very dry summers will be beneficial. Best planted in a protected position as the larger plants can suffer damage in windy positions. Young plants can be pruned to shape and form if desired. Easy by cuttings, however the sap is irritating and can cause skin and eye problems. Spread – Will branch as the plant grows. 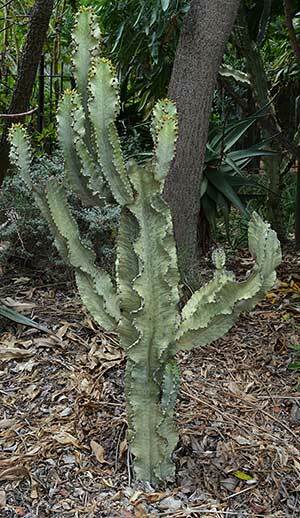 Euphorbia ammak is not readily available for sale in Australia at present.